Harry K. Fukuhara was born in Seattle, Washington. on January 1, 1920. He served 48 years in active military and civil service for the U.S. Army. Harry supported many social chapters of the Nisei Community including J.A.C.L, M.I.S NorCal, and N.J.A.H.S. In 1988, Harry was recognized for his career contributions with the induction into the U.S. Army Military Intelligence Hall of Fame. In 1990, he received the 3rd Order of the Rising Sun, Gold Rays with Neck Ribbon from the Emperor of Japan. He received the President's Award for Distinguished Federal Civilian Service and awarded from U.S. President Bush. In 1993, he was honored with the Distinguished Member of the Military Intelligence Corps. Harry K Fukuhara, 95, formerly of San Jose, California, died on April 8, 2015 in Hawaii. In the fall of 1942, Harry Fukuhara had a tough decision to make. He was an American by birth -- born in Seattle in 1920 to Japanese parents who had immigrated twenty years earlier. When his father died in 1933, Harry's mother decided to move the family back to her homeland, in Hiroshima, Japan. There, Harry attended school with his brothers and sisters while becoming fluent in the Japanese language and familiar with the culture of his ancestors. But the climate in Japan was becoming more and more hostile towards the United States and Harry often felt that resentment directed towards him personally. Sensing that he didn't belong, at the age of 18, Harry moved back to America as soon as he had saved enough money for a one-way steamer passage. His three brothers decided to stay in Japan with their mother, all eventually serving in the Imperial Japanese Army. Enrolling in Glendale Junior College in California, Harry realized the anti-Japanese sentiment in the country of his birth was even more unsympathetic. Nevertheless, he managed to finance his way through college, earning an Associate's Degree in June 1941. Six months later, following the Japanese attack on Pearl Harbor, President Roosevelt signed Executive Order 9066, ordering the removal of all US citizens of Japanese ancestry into internment camps. Harry was sent to a detention camp in Gila River, Arizona. He bitterly resented being rounded up and forced into the camp like cattle. He was appalled at the anti-Japanese mass hysteria that he encountered. Treated like a criminal by his own country, he was hurt, frustrated, and disappointed. In an interview with the INSCOM Historian, Harry discussed having to choose which country he claimed, "Having lived in both countries, I chose U.S. although the circumstances were not enviable at the time. I have never regretted making that decision." The only way he felt he could choose America was to join the Army and fight against Japan. In his own words, "I realized the time had come for me to decide whether I wanted to be 100% American and fight for my rights, or accept the alternative which was questionable." It would be four long years before he would learn about anything about his family living back in Japan. 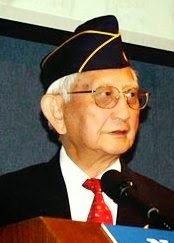 Harry enlisted in November 1942 and was sent to Camp Savage, Minnesota, with a number of other Nisei, or second-generation Japanese-Americans. Already an excellent linguist, he was told his services were needed as interpreter, interrogator, and translator. Upon graduation in May 1943, the 22-year old Soldier was rushed to Australia and then on to New Guinea as part of the Allied Translator and Interpreter Service, or ATIS, having not received a single day of basic military training. 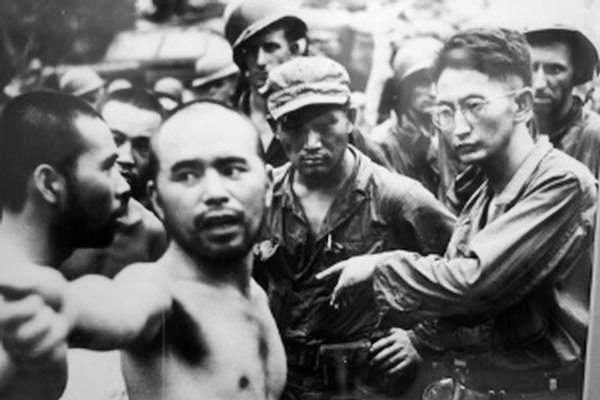 Fukuhara found himself first a member, and then team chief of a 10-man interrogator-interpreter team made up of American, Dutch, and Australian military personnel. The Nisei sergeant was determined to convince American commanders of the value of capturing Japanese Soldiers for intelligence purposes. He understood the Japanese cultural reputation for ferocity as warriors, but also recognized their naiveté under skillful interrogation. As a result, Fukuhara's team had great success in eliciting critical information from Japanese prisoners-of-war and captured documents throughout the war. In addition, they prepared surrender leaflets, and participated in missions to persuade Japanese soldiers to surrender, reconnaissance missions with native scouts, and as members of US Navy PT boat patrols. For his accomplishments in the field, Fukuhara was promoted through the ranks to Master Sergeant and awarded a Bronze Star with two oak leaf clusters. On August 10, 1945, he received a battlefield commission to Second Lieutenant. However, his success came at a personal price. In the summer of 1945, Lieut. Fukuhara was stationed in the Philippines. The US military was planning an invasion of Kyushu, on mainland Japan, not far from Fukuhara's family home in Hiroshima. He had not heard from his family since the war began, but he was greatly concerned that he could be facing his own brothers in combat. He told the INSCOM historian, "I was suffering from battle fatigue and I had been hospitalized several times with malaria. I was physically and emotionally exhausted." He needn't have worried; the invasion of Kyushu never materialized. Instead, the atomic bomb was dropped directly on his former hometown. 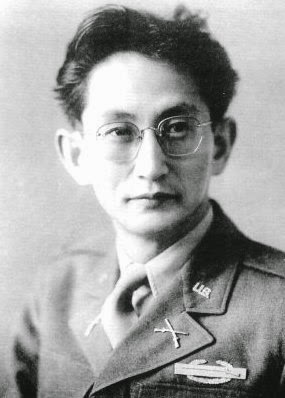 It was 2nd Lt. Fukuhara's duty to inform the Japanese prisoners-of-war who were being held near Manila about the bomb. Historian James McNaughton recounts Fukuhara's recollections in his book, Nisei Linguists: "I told them that a new bomb called the atomic bomb, equivalent to thousands of tons of TNT, had been dropped on Hiroshima on August 6, and that one single explosion had completely wiped out the entire city of Hiroshima and that it had been erased from the surface of the earth. I told them nothing living had survived and that all human and animal life was non-existent. I further elaborated that no vegetation, plant life or tree would grow there and people would not be able to live there for at least 100 years, due to radiation. When I told them that, they were silent -- either they did not believe me or else the information was beyond their comprehension. I know that I did not want to believe it myself." Three days later, the Air Force dropped a second bomb on Nagasaki. Harry Fukuhara, a man who had been torn between two nationalities all his life, was once again torn by his emotions. Elated that the war was ending and that he would not be participating in the long-dreaded invasion; shocked that the bomb had been dropped on a town where he had once lived, where his mother and brothers still lived; and depressed from a sense of guilt that they had died because of his choice to fight against them. In fact, half of all the Japanese immigrants to the United States had come from Hiroshima and its neighboring prefectures. The Nisei found themselves in an impossible situation once again. About a month after the war ended, Lt. Fukuhara was assigned to Japan for the occupation. We was able to return to Hiroshima where he found his mother and her sister safe -- they had survived the bomb by hiding in an underground shelter -- but his older brother, Victor, seriously ill. Victor had been on his way to work when the bomb exploded very near him and he died of acute radiation sickness within the year. His mother would live another 20 years. Harry Fukuhara served another 25 years in the Army, retiring as a Colonel in 1971. He then served as a Department of the Army Civilian for an additional 20. His career after the war was primarily in counterintelligence, during which time the most important lesson he learned was the understanding of jin-myakie, loosely translated as personal human connections -- the basic ingredient of Human Intelligence. Colonel Fukuhara was inducted into the MI Corps Hall of Fame in 1988 and has served as a Distinguished Member of the Corps since 1993.